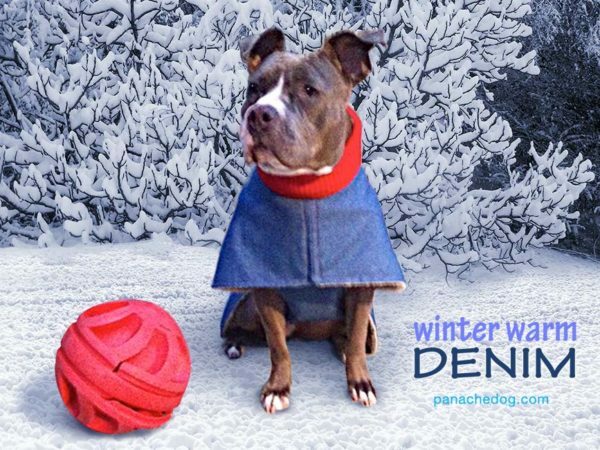 Protect your dog with a warm winter dog coat! We could no longer resist the urge to add this ever popular fabric to our collection, and choose a medium blue denim for its softness and flexibility. Fully lined in black fleece or cream sherpa for warmth, our coat sports a unique rib knit neck for ultimate protection from the cold. 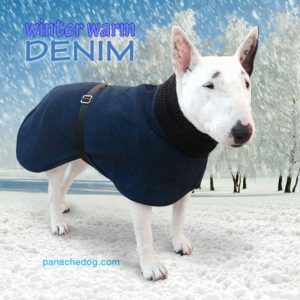 Fully washable, designed for WARMTH, FIT and COMFORT our denim coat is the ULTIMATE winter coat, that both you and your dog will love ! This coat is designed for the EXTREME COLD and will protect your dog to sub zero temperatures. 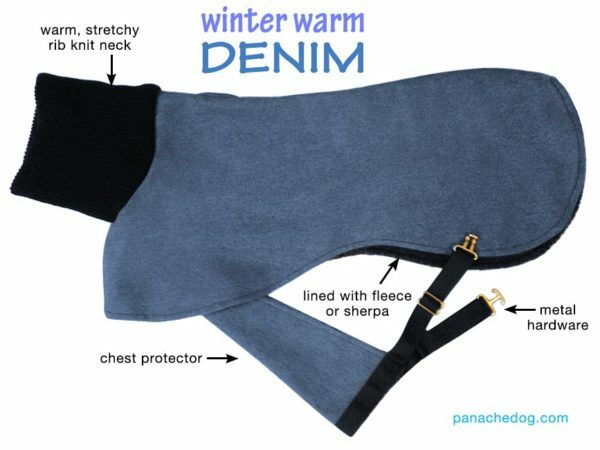 Also ideal for dogs that are short haired, or thin, also for the older dog that needs extra protection from the harsh elements. As always, we included a chest protector to keep your dog warm from top to bottom, with a adjustable belt for easy fit and comfort. 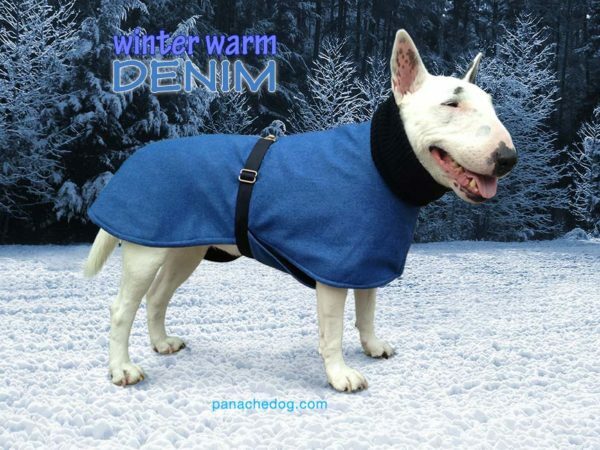 Find out how the Panache Dog Coat is designed for comfort and warmth. I have a male mastiff and have never been able to find a coat that will fit let alone go over his huge head until i found Panache Dog. This coat is amazing, it’s actually big enough to fit him and he weighs 125lbs. I was also surprised to see the coat is fully lined with a thick fleece, which keeps him nice and warm. I bought the coat last year, so this will be the second winter, its been washed so many times,and thrown in the tumble dryer, it has not shrunk and still looks great. I highly recommend this coat.